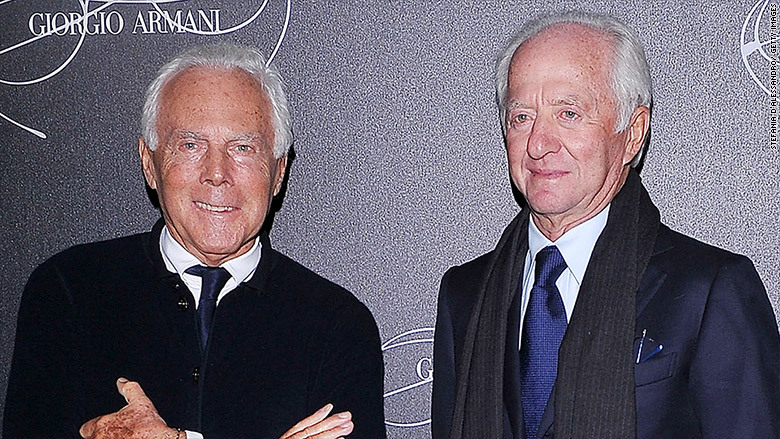 Luxottica's Leonardo Del Vecchio on the right with Giorgio Armani. This boss is definitely better than your boss. The founder of eyewear giant Luxottica (LUX) has granted his Italian employees around €9 million ($10 million) worth of shares in the company. The gift from Leonardo Del Vecchio is designed to thank workers and mark his upcoming 80th birthday. "With this small gesture, I would like to show how important the employees are to me: I truly feel as if we are family," Del Vecchio said in a statement. The company has 77,000 employees worldwide, but only Luxottica's 8,000 Italian workers will get to share in Del Vecchio's birthday present. That will work out to $1,200 in share each. Up to 140,000 shares will be distributed, but the gift won't make much of a dent in Del Vecchio's bank account. He's one of Italy's wealthiest men and ranked 40th in the 2015 Forbes rich list with a fortune of more than $20 billion. Luxottica makes a range of eyewear brands, including Ray-Ban and Oakley, and has more than 7,000 optical and sunglasses stores worldwide. The gesture comes on the heels of another act of C-suite kindness. The chief executive of Gravity Payments Dan Price took a 90% pay cut and slashed his company's profits last month just so he could give his employees a raise. The Seattle-based payment processing firm he founded has pledged to make sure all of his staffers make at least $70,000 annually in the next three years.